Take to the Road was launched on the 21st January 2015 by classic car enthusiast Niall Julian. Niall has been a car enthusiast for as long as he can remember and got his first taste of classic motoring when he purchased a 1967 Daimler V8 250. This purchase lead him on a car journey (no pun intended) which resulted in the creation of Take to the Road. Niall loves classics because of their rich history and the stories they have to tell. It is the human connection that he finds fascinating. Like any car enthusiast, he has a list of car he’d like to own… a very long list. Basically every car featured on this site is on that list and is one of many he’d like to own and drive one day. Niall runs Take to the Road by himself. He directs, produces and edits all of his own films, making Take to the Road’s YouTube Channel a one man classic car show. He is also a keen photographer and shoots all the cars that feature on his channel and website. Niall on location filming with Alfa Romeo Spider owner Colin Craven. Every car and its owner has been on a journey. There is so much passion and emotion wrapped up in them. And Take to the Road’s films capture and document this. It is a little snapshot of a classics history, putting the car and its owner front and centre. Their moment of fame. Take to the Road is all about the passion and the obsession that comes with being a classic car enthusiast. And of course getting out there a driving them…. Hence our slogan #JustGoDrive! Niall and Take to the Road were winners at the 2016 UK Blog Awards in London, taking home the top prize in the Individual Automotive Blog Category. More details on this exciting win can be found here. 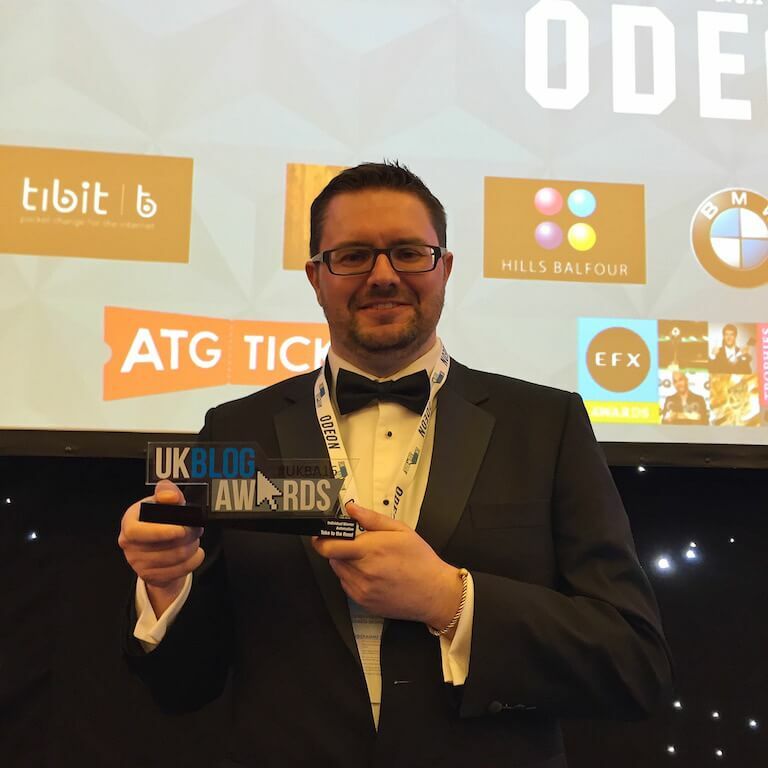 Niall followed up his 2016 win at the UK Blog Awards by coming 2nd in the Best Individual Automotive category at the 2017 UK Blog Awards, coming away with a Highly Commended mention at the awards ceremony in London. More on Take to the Road’s 2nd place finish can be found here. Take to the Road has also been awarded the prestigious rank of Vuelio Top 10 UK Automotive Blogs for 2017. This annual award recognises the best blogs in the UK and Take to the Road made the list for the very first time. You can read more about Take to the Road’s Vuelio rank and blogger spotlight here. The awards keep rolling in for Take to the Road and the site has recently received the prestigious iVisa Global Blogger Award for 2017. This award recognises blogs of merit around the world and it is a great honour for Take to the Road to be selected as one of the top UK car blogs. You can read more about Take to the Road’s iVisa Global Blogger Award here. Niall and Take to the Road followed up its 2017 Vuelio Award with yet another for 2018. You can find out more about making the Top 10 UK Automotive Blog list here. 2nd year running for Take to the Road to make the Vuelio list! Take to the Road picked up another blog award, this time from the team at car finance experts CarMoney! You can find out more about the accolade here. 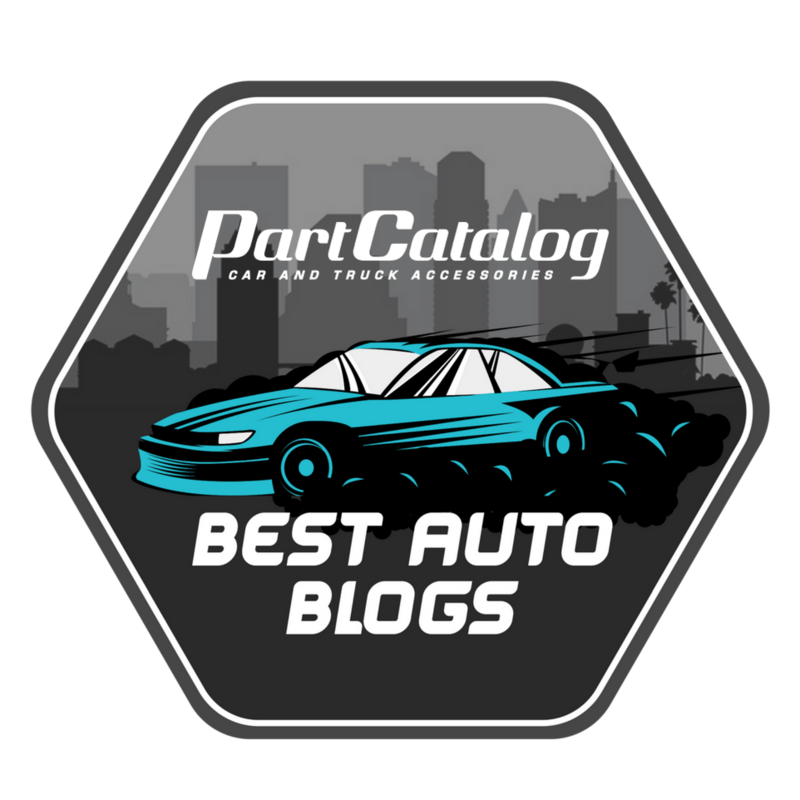 Another blog award for Take to Road this time from CarMoney! Take to the Road has received another accolade for 2018, this time picking up Best UK Car Blog 2018 from Glovebox Direct. You can find out more about this award here. Thanks to Glovebox Direct for the award! Take to the Road has once again been chosen for the Top 10 UK Automotive Blog Vuelio Award, for the third consecutive year! Which is a fantastic achievement. You can find out more about it here. 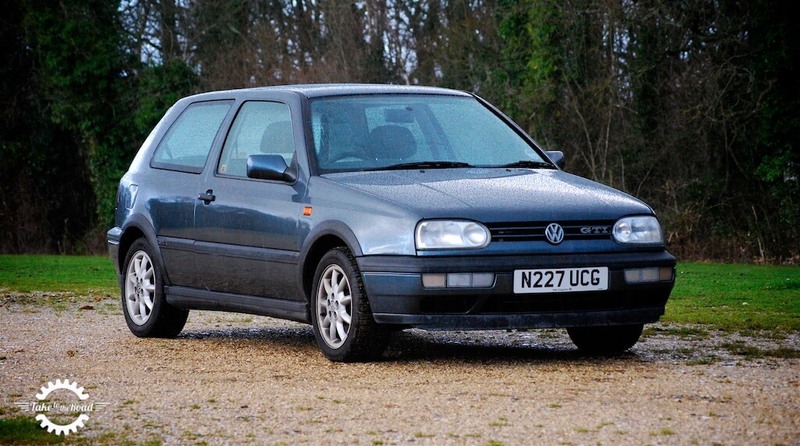 Niall’s first car was a 1993 VW Golf 1.9 CL diesel. It was a very reliable and frugal car, which is exactly what you need when you have just left university. It was a nice wine red colour and although it didn’t have a lot specification wise (one had to plumb for the GL or the GTi to get such nice things as electric windows etc), it was a practical car. It might have been slow but it was fun. In 2004 the diesel Mk3 started to play up. After 124,000 miles the gearbox was starting to crunch which meant an expensive rebuild or swap. The cost of which far exceeded the value of the car. After looking around for replacements, Niall stumbled across a 1995 MK3 Golf GTi. It was a 3 door in gunmetal grey, had covered 64,000 miles and was a one owner car. Plus it had the rare combo of an electric sunroof and aircon. Having always dreamed of owning a GTi Niall knew this was his chance to finally own one. And the deal was done. The Mk3 Golf GTI 8v has its critics but Niall loves his. It is a keeper! Niall still owns his 2 owner Golf GTi. And you watch his video about it here. Niall’s first ever classic car was a gorgeous 1968 Daimler v8 250. It was a chance purchase at a time when classics were still relatively cheap, compared to the rather inflated prices for a lot of examples today. Hooked on the idea of owning an old car, especially one with a V8, the search began. And up came this alternative to the Jaguar Mk2. With a Daimler 2.5ltr V8 and an automatic gearbox, this was a lovely car to drive. A comfortable cruiser with a wonderful burble from that Turner designed hemi V8. Niall decided to sell the Daimler in 20014. It is a car he misses to this day. The Daimler was literally gone just a couple of weeks when the itch for a classic returned. 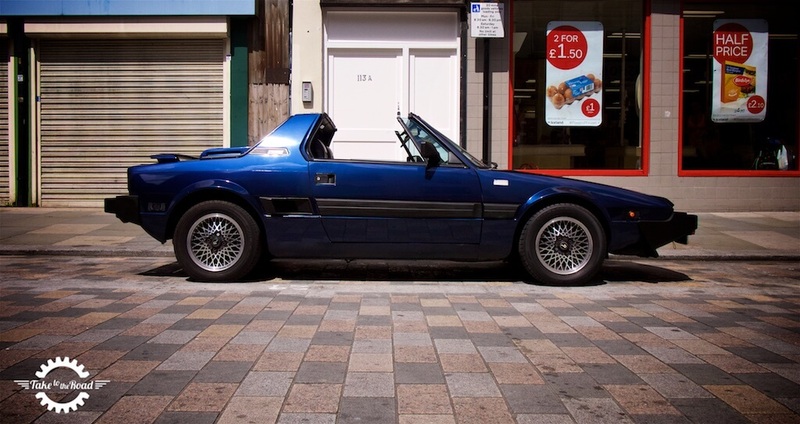 It really didn’t take long until Niall found his next classic car, a 1990 Bertone x1/9 Gran Finale. To those who don’t know what a Bertone x1/9 is, it is basically a mid engine, two seat Fiat. It is fantastic fun and handles like it is on rails. If you haven’t driven one you really need to get behind the wheel of an x1/9. They are that good! The Bertone x1/9 is a mid engine 2 seat sports car made by Fiat and designed by Bertone. In 2015 Niall hatched a plan to make the 30th anniversary of the launch of the Jaguar XJ40 saloon. He found a low mile project Sovereign and took it on road trip to Ireland. It was one of the most refined cars he has ever owned. And it performed superbly on the trip to Ireland (you can watch the video of the journey here, Part 1 and then the final leg of the trip in Part 2). Niall sold the Jaguar in 2016 and kind of wishes he hadn’t. It really was a lovely car! In 2017 Niall added another Italian to the Take to the Road collection. This time a very pretty Alfa Romeo Spider S3. Best described as a rolling project, the Spider is actually pretty solid for an old Alfa. The plan with this car is to go through the mechanicals, getting it running well and sort out some of the cosmetic issues. And of course enjoy some top down motoring in one of the prettiest convertibles ever made. Watch the video Niall made on the day he purchased his first ever Alfa Spider. And watch Niall’s final video in his S3 Spider which he sold in 2018. Take to the Road’s new project a gorgeous Alfa Romeo Spider S3. It needs a little tlc but it is solid. Continuing with his passion for cars with a a great story, Niall acquired a rare Vauxhall Viceroy. This car was first owned by Vauxhall UK for two years before passing to its 2nd owner who kept it for 34 years! It is a surviving example of a car that was actually a rare sight on UK roads back in the 1980s. And it is a fascinating slice of the General Motors/Vauxhall/Opel story. And you can follow its onward journey with Niall and Take to the Road right here. Including its recent trip home to Vauxhall in Luton which you can watch here. Keep in touch with all things Take to the Road by signing up to our e-Newsletter, follow us on Twitter, like us on Facebook, follow us on Instagram and of course, don’t forget to check out and subscribe to the YouTube Channel. And you can also support Take to the Road’s mission on Patreon. And remember…. Just go drive! Is your blog primarily interested in foreign cars? Reason I ask is I have a American made classic which I really don’t want to part with but I’m going to sell it so any feedback as to where I can showcase my car for sale would be appreciated thanks in advance. Hi David, we’re interested in classics from all over. Drop us an email over at hello@taketotheroad.co.uk and we can chat about it further. Thanks.